Will just run once, then never come back and run again. Still active in the taskbar, but in the log it only shows to run once. I have it setup to run every 5 minutes, but it only runs the first time. here's the last few attempts from scheduler log. seem to complain about NFLSCORE.TXT missing.. not sure why a bball pool would be looking for that. 03/15/2018 01:04:03 PM - Next scheduled trigger will occur at 1:05:00 AM but will only run between 8:00:00 AM and 3:00:00 AM. 03/15/2018 01:07:54 PM - Next scheduled trigger will occur at 1:10:00 PM but will only run between 8:00:00 AM and 3:00:00 AM. 03/15/2018 01:10:00 PM - It is now 1:10:00 PM, time to trigger. 03/15/2018 01:10:00 PM - Turbo Tourney has been triggered in Schedule Watch mode. 03/15/2018 01:10:00 PM - Call Complete. 03/15/2018 01:10:05 PM - The following message was displayed: The NFL scores file (C:\ncaa\tt\nflscores.txt) was not be found. 03/15/2018 01:50:44 PM - Next scheduled trigger will occur at 1:55:00 PM but will only run between 12:00:00 PM and 3:00:00 AM. 03/15/2018 01:55:00 PM - It is now 1:55:00 PM, time to trigger. 03/15/2018 01:55:00 PM - Turbo Tourney has been triggered in Schedule Watch mode. 03/15/2018 01:55:01 PM - Call Complete. 03/15/2018 01:55:06 PM - The following message was displayed: The NFL scores file (C:\ncaa\tt\nflscores.txt) was not be found. 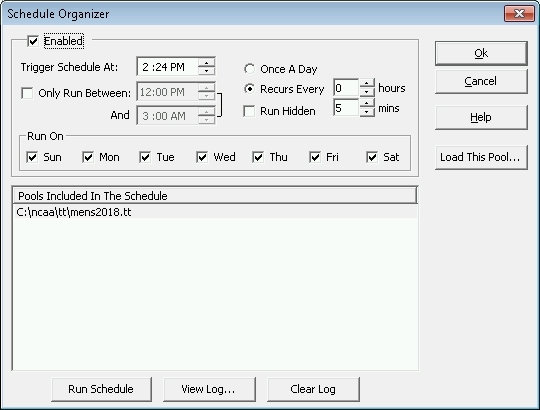 Look in Tools -> Schedule Organizer. What is listed under 'Pools Included In The Schedule'? Was the program open during this time, or did you close do the main TT program? I don't recall offhand if it runs when the program isn't active, so just asking for now. Also, can you post a screen shot of what your scheduler settings are. Scheduler WILL run if the program is open. You just won't see results in the open program (you'd have to close, not save, then reopen the program to see results). I don't see an image. I am still waiting for confirmation from a couple of people that this fixes the issue but wanted to respond to this post as well. Just to add though, this should not cause any issues with *WHEN* the scheduler runs... it just won't process your scheduled pools. So it may not be the cause of this thread. Ahh, my issue then, at work and they block a lot of sites, so it just didn't show up for me, sorry about that. Log File looks more "normal" now.. No references to NFLSCORES.TXT and logs correct that it ran and the next time to run. 03/15/2018 03:04:15 PM - Next scheduled trigger will occur at 3:05:00 PM. 03/15/2018 03:05:00 PM - It is now 3:05:00 PM, time to trigger. 03/15/2018 03:05:00 PM - Turbo Tourney has been triggered in Schedule Watch mode. 03/15/2018 03:05:00 PM - Call Complete. 03/15/2018 03:10:18 PM - Checking for any open internet connections. 03/15/2018 03:10:18 PM - Found recurring option of every 0 hours 3 minutes. 03/15/2018 03:10:18 PM - Schedule time was not reset to 3:08:00 PM as that is now in the past so will be reset based on current time. 03/15/2018 03:10:18 PM - Schedule time has been reset for 3:13 PM. 03/15/2018 03:11:00 PM - Schedule time has recently changed. Next scheduled trigger will occur at 3:13 PM. 03/15/2018 03:13:00 PM - It is now 3:13 PM, time to trigger. 03/15/2018 03:13:00 PM - Turbo Tourney has been triggered in Schedule Watch mode. 03/15/2018 03:13:00 PM - Call Complete. 03/15/2018 03:13:06 PM - The scheduled job has skipped the pool file of C:\ncaa\tt\mens2018.tt because it does not contain any new game results. 03/15/2018 03:13:06 PM - Checking for any open internet connections. 03/15/2018 03:13:06 PM - Found recurring option of every 0 hours 3 minutes. 03/15/2018 03:13:06 PM - Schedule time has been reset for 3:16:00 PM. Great to hear! Thanks for sending that follow-up! !